I call this set Lazy DJ, because I play all extended arrangements which means less mic breaks and more music. We begin with a rip-roaring arrangement of Aaron Copeland's Fanfare for the Common Man by Emerson, Lake and Palmer. Next we keep the energy level at maximum with a couple from early Weather Report. We go back to Prog-Rock with Close to the Edge from Yes. Thus far, everything we have played is from the early '70s. We time shift from there to our current era with Five Peace Band led by Chick Corea and John McLaughlin performing from the Miles' classic In A Silent Way to finish this podcast. This show really cooks for Father's Day. Starting with a unique project from tenor player and arranger Travis Sullivan doing his take on Bjork tunes. Cyrus Chestnut has a new one with Hartford's own Dezron Douglas. While we are featuring hometown cats, we play from the Curtis Brother's latest release. The Cookers were in town, and I play two from them. Horace Silver helps celebrate Father's Day with his classic Song For My Father. We finish out this podcast with three cookin' tracks from the late Joe Farrell. This extended In The Groove podcast features Frank Varela and the VLM Project. 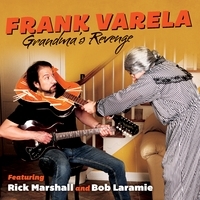 Frank, Ricky Marshall and Deva Varela are in our studio to talk about the newly released CD Grandma's Revenge. We also revisit the CD So Real featuring Deva on vocals, flute and harmonica. Ricky speaks about his older brother, the late great west coast drummer Eddie Marshall, and we pay tribute with some of his compositions and recordings. Also on this podcast are other influences of Frank's; Wes Montgomery and George Benson. This show begins with Jazz pianist, composer and educator Noah Baerman. Noah also struggles with Ehlers-Danlos Syndrome (EDS), an incurable connective tissue disorder. Last month was EDS awareness month, and I had pledged to highlight EDS on this podcast. Please check out Noah's blog post at his website ( http://noahjazz.com ) for more information. We feature other Connecticut jazz artists on this week's show and some great jazz cats from Rochester NY. We have Jen Allen, Jimmy Greene, Noah Preminger, Frank Varela, Peter Greenfogel from CT, and Mike Melito and the Sneider Brothers from Rochester. Rounding out the show are Ambrose Akinmusire, Ornette Coleman, Chick Corea and John McLaughlin. This makes for a very eclectic mix. Hope you dig it.